The current situation going on in some heads is that during her BET Awards acceptance speech, Nicky Minaj was subbing/throwing shade at new comer Iggy Azalea. While accepting the award for Best Female Hip Hop Artist, Nicki made reference to writing her own lyrics when she said, when you hear Nicki Spit, Nicki wrote it. After she said that the crowd got a bit noisy because it looked like she was referring to co-nominee Iggy who is also T.I’s protege. Le’Sigh. Many figured she was implying that T.I writes for Iggy. Now here is the thing. After Iggy addressed the issue Nicki also decided to clear things up. 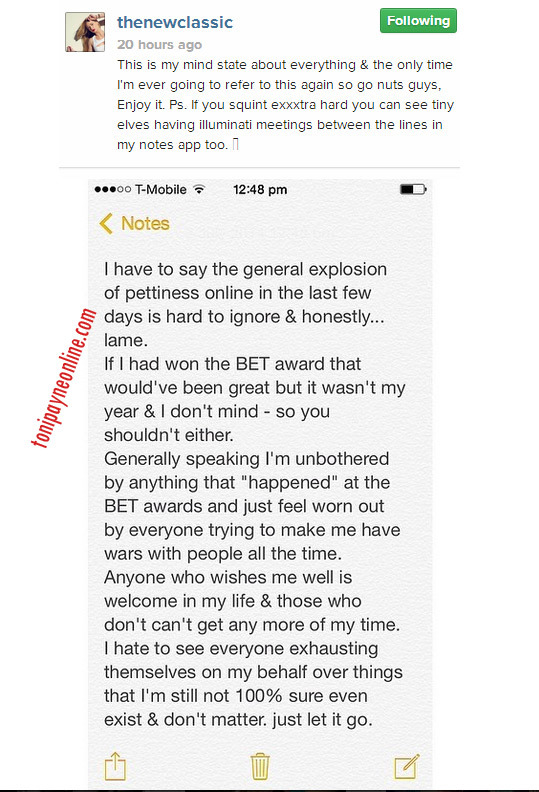 Yesterday, Nicki Minaj went on her twitter page to spit some words regarding the matter. Read it below and also check out screen grabs of her tweets. I’ve congratulated Iggy on the success of Fancy, publicly. She should be very proud of that. All the women nominated should b proud. Prev Whats up with Scott Disick and Khloe Kardashian? Is he loving the wrong sister? I don’t know if Nicki was really talking about Iggy at the awards. I agree with you. I’m not sure how people came to the conclusion that Nicki was talking about Iggy. I guess because she was the only other rapper nominated and there to perform, but nothing in her speech suggested she was talking about Iggy. Nicki looks misshapen in that shot. I don’t think Nicki was talking about Iggy. I’m not sure how people pulled Iggy’s name out of the clouds, when the whole Cash Money team was dancing and supporting her performance. No names were mentioned, she could have still been talking about Lil Kim, or addressing rumors that she has a ghost writer.